I was searching through some CDs last night looking for pictures for a new project and came across some shots from a family vacation to New York. Every year when I was growing up Mom watched the Macy’s Thanksgiving Day Parade on TV. It was her dream to see it in person one day and in 2004 that’s what we did – Mom, Dan, Sis, Harley and I* flew to New York for Thanksgiving week to see the parade and everything else we could fit into a week. It was wonderful! Okay, I didn’t really care for the parade because of the crowds, but I was there for other reasons. 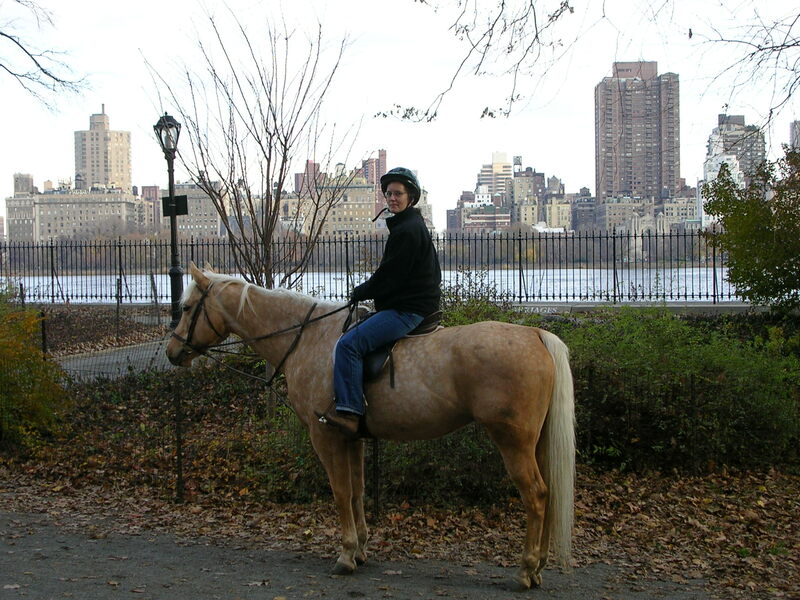 I wanted to ride a horse in Central Park. Crazy, right? The stable itself was amazing to someone who was used to horses being housed at ground level. 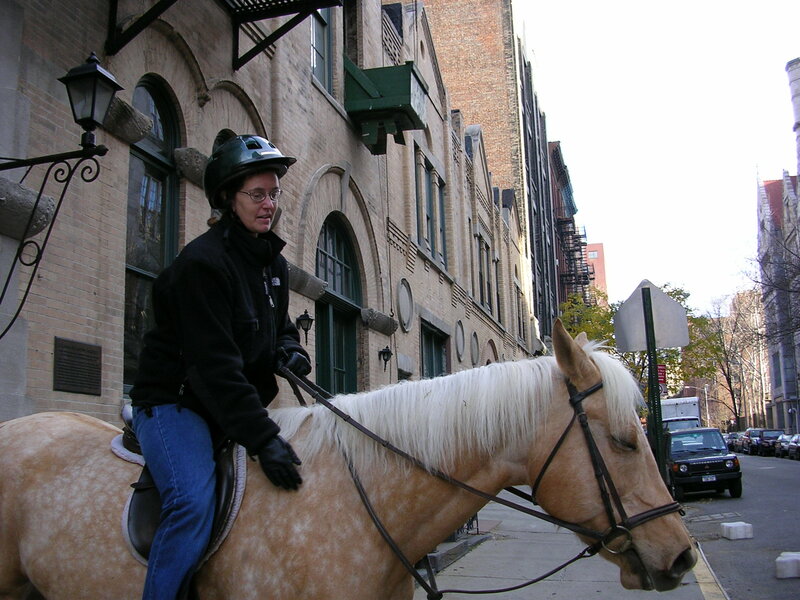 A woman yelled down into a door for Gillespie and in a minute there was a thundering of hooves on wood and here came a lovely dappled palomino up the steep ramp, saddle and bridle on. He paused in the doorway, looked around, saw me and walked right up. This horse knew his stuff and was ready to get out of there. Not being a total idiot, I mounted up to ride a bit in the arena and was disappointed to find Mr. G (as I called him in my mind) was rather nappy and not at all happy to be trotting circles around the other riders and the support columns spaced regularly around the very small arena. As soon as we stepped outside, however, he perked right up and heaved a big sigh as if he’d been waiting for days to see the sunshine, and maybe he had. The picture above makes him look sleepy, but what you don’t see is the ambulance with sirens on and flashing lights that had just passed. Mr. G stood firm, not even flinching when it came roaring up and around the corner. I was terrified that he would do something stupid, but he was not at all fazed by the Big City. In order to get to the bridle paths in Central Park, we had to walk with the traffic (one way) two blocks and then turn two more corners (more one way traffic) and cross a very busy street into the park proper. 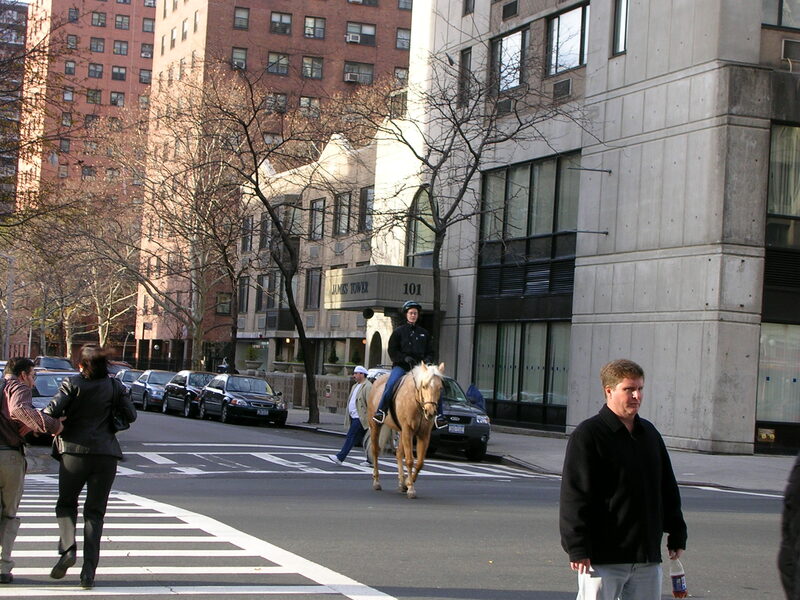 It was quite an experience – no one batted an eye to see a horse calmly walking along, cars zipping by on one side, bikes and pedestrians on the other. Once we reached the park there was just enough time to circle the lake before the rental time ran out. It was a beautiful November day, partially cloudy with no wind. In fact, the weather the entire week was wonderful for November – chilly but not cold and dry most of the time, almost like Winter was holding off so we could enjoy a once-in-a-lifetime trip. We returned to the stable and Mr. G went right back down the ramp after I gave him a couple of carrots for being such a good boy. I thought it must be a hard life for him, not being able to graze outside, but he seemed happy enough and didn’t hesitate to head back to his stall. * The narc (of course) refused to attend because his privacy could not be maintained and so he stayed home. I was instructed to call him every evening at 7:00 his time (11:00 PM in NY) to report in. We were running all day and he expected me to call him after everyone else went to bed. I resented it and lost a lot of sleep just to please him – after all, I had “abandoned” him to go gallivanting off with my family instead of staying home to take care of him. Whatever. That would be an amazing experience! I love palomino’s too! They still have the horsedrawn carriages through the park. Though the new mayor is trying to get rid of those too. They do still have the carriages, but I don’t know where the horses are stabled. Do they truck them in every day? Thank God the narc didn’t go. I bet you wouldn’t have been able to do this ride if he had, and it looks awesome. I’ve always wondered what it would be like to see the Macy’s parade in person. I love that your whole family made your mom’s dream a reality. This kind of reminds me of a miserable vacation I had in Las Vegas with my (now ex) husband a few years ago. I’ve always vowed to get back there and actually Have. Fun. It’s Vegas for goodness sake, people actually do have fun there; right? I am so glad your vacation was fun. Even if you did have to call in to the narc, at least he wasn’t there. Thank God he was not there. The narc couldn’t walk long distances, so it wasn’t really an option. I would have been stuck in the condo keeping him company instead of walking all over Manhattan, which would have been a crying shame. He didn’t go on the cruise to Mexico, either, but that’s another blog post.